The floorplans you add into iSpy are exposed through iSpyConnect. These floorplans give you a good overview of the current state of your cameras and microphones and are updated in real-time. The thumbnails along the top of this tab (there's just one in this example but iSpy supports an unlimited number of floorplans) are also live. Any alerts that are triggered will automatically cause a refresh of these plans. You can also click on the cameras in the floorplan to view a live feed in the Live Viewer and double-click them to jump to the content view for that object (this applies to microphones as well). The flooplan alert history provides a text summary of all the events that have come through since the web page was opened. Click on an entry here to jump to the saved content for that object. The checkbox (top of tab) enables or disables audio alerts through the browser. 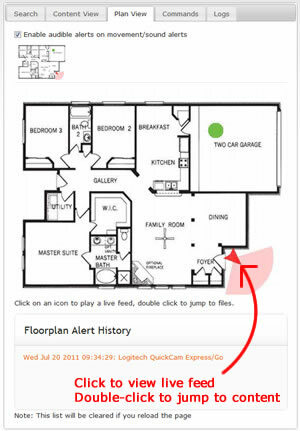 If any camera or microphone on any floorplan is triggered by an alert iSpyConnect will play an alert sound. You will then be able to switch to this tab to see the highlighted object that is in the alert state. If you miss this event it will be recorded in the Floorplan Alert History.